The U.S.-Iran conflict has acquired an air of inevitability. The last ten years appear as a slow-motion prequel to a pre-destined outcome: War. While structural factors have helped push the two actors towards confrontation, there has never been anything inevitable about this conflict. Rather, a long series of miscalculated escalations have brought the two states to the current deadlock. 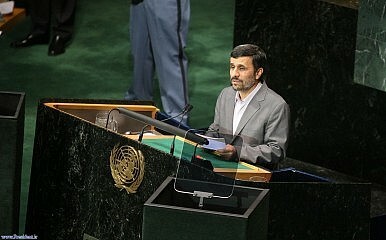 Iran and the United States are entrapped in a paradigm of enmity. Within the mindset of this paradigm, both assume the worst about the other’s intentions. The “other” embodies almost pure evil, and everything it does is aimed at making life more difficult for you. The gradual adoption of this mindset has created a self-fulfilling prophecy—acting on those assumptions has further entrenched the two sides and rendered a solution to their tensions more difficult. All actions of the other have been interpreted from a lens of absolute, unwavering suspicion. Information that appears to vindicate the mistrust has been seized upon, while data that contradict it have been dismissed, neglected or disbelieved. Moreover, according to the conspiracy-like understanding that has emerged from this mindset, the other side is believed to have a magnificent grand strategy. All its actions “fit” into this grand strategy and push the country closer and closer to its assumed goal. In the case of Iran’s view of the U.S., the assumed goal is the destruction of the country and replacement of the current regime. All America’s actions are believed to serve this ultimate objective. America is systematic, precise and callous in its pursuit of regime change and the defeat of Iran, the Iranians believe. Thus, when the U.S. rejected a negotiation offer in 2003 in which the Iranians put everything from their support of Hezbollah, to opposition to Israel to their nuclear program on the table, Tehran viewed that as a vindication of its paranoia regarding American intentions. When President Obama rejected the fuel swap proposal brokered by Turkey and Brazil in May 2010, even though he in a letter to the leaders of Brazil and Turkey three weeks earlier had endorsed the exact deal they managed to secure, Tehran read that as evidence that Obama’s true intent was to sanction Iran regardless of what compromises Iran would agree to. A broader understanding of Obama’s domestic political constraints didn’t register in Tehran. Even the occasional U.S. offers to negotiate have been viewed by Tehran as an attempt by Washington to win time and international support for even more crippling sanctions. Talks designed to fail will increase pressure on Tehran and open the door for more sanctions and even military action, the reasoning goes. “Whatever positive Iran did, the response was always more and more isolation,” an Iranian diplomat told me in Tehran in 2004. The conclusion, he hinted, was that the U.S.’s real objective was to prolong the conflict until it could bring the regime to its knees. Similarly, the U.S. assumes that all Iranian actions are geared towards winning time to advance their nuclear program and present a nuclear fait accompli. When Iran rejected the U.S. offer in 2006 to discuss the nuclear issue—albeit with the precondition that Iran first suspend enrichment activities—Washington interpreted that as evidence of Iran’s long-term intent to seek nuclear weapons. The problem was not with the precondition for the talks, the argument went, but rather with Iran’s disinterest in real diplomacy. In Februay 2010, Tehran began enriching uranium at the 20% level, following its rejection of a fuel swap proposal by the U.S. and the West’s refusal to sell fuel pads for Iran’s production of medical isotopes for cancer patients. To Washington, this result was not born out of the failure of the talks and Iran’s growing desperation to provide medicine for its cancer patients. Rather, in a calculated and premeditated fashion, the Iranians had engineered the collapse of the talks in order to have a pretext to expand its nuclear program and inch closer to a nuclear weapons capability. It was all an ingenious plan. The detail that “proved” this reading of Iranian conduct was the fact that Iran’s escalatory steps were timid and small enough not to generate a harsh response from the international community. That way, Iran could slowly and patiently achieve a weapons capaibility without paying the high price that a swift, dash-for-the-bomb strategy would bring about. Similarly, when Tehran accepted a variation of the American fuel swap proposal through Turkish and Brazilian mediation, Washington and its Western allies read Iran’s agreement to compromise as a last-ditch effort to evade United Nations Security Council sanctions. It was just another act of deception by Iran aimed at splitting the international community—a tactical maneuver designed to recalibrate the strategy of expanding the nuclear program through small steps that did not generate an international backlash. The fact that the Iranians were saying yes to a proposal that was built on the American swap proposal from October 2009 and which Obama himself had endorsed in letters to the leaders of Brazil and Turkey mattered little. Tehran’s conduct simply fit too well into the theory on Iran’s grand strategy. And within the paradigm of enmity, theory trumps reality, and assumptions and conclusions are the same. Like all conspiracy theories, “the grand strategy” belief offers comfort and a sense of orientation. It also exonerates the beholder of any wrongdong since the disastrous situation between the two countries is a product of the evil designs of the other side, not of any mistakes or miscalculations of one’s own making. As appealing or comforting as this theory may be, it simply doesn’t hold up. A far more plausible explanation for the current deadlock is not that the two sides have a glorious grand strategy but that they actually don’t have a strategy at all. European officials I interviewed for my book A Single Roll of the Dice – Obama’s Diplomacy with Iran admitted as much, insisting that their coordination meetings focused on the next tactical steps rather than on a broader strategy. Rather than working according to a premeditated design, the two sides have reacted to each other based on worst-case assumptions and the unquestioned belief that the other side invariably is acting with hostility. Opportunties have been missed and hostilities have drawn far beyond what either side actually originally intended. Neither side wanted to or planned to go as far as they have in their grandstanding. The two countries are on the brink of war due to this vicious cycle of unending escalation and counter-escalation, born from their unquestioned assumptions and conclusions about each other. Only by revisiting these assumptions and questioning these conclusions can a path towards peace be found. If this pattern is not broken, however, then open war is indeed a likely outcome. But there has never been anything inevitable about this man-made disaster. Trita Parsi is the founder and president of the National Iranian American Council and an expert on US-Iranian relations, Iranian foreign politics, and the geopolitics of the Middle East. He is the author of Treacherous Alliance: The Secret Dealings of Iran, Israel and the United States and A Single Roll of the Dice – Obama’s Diplomacy with Iran.